One of the nice things about visiting Steve and Emily is that they enjoy playing the roles of culinary tour guides. After Emily showed me Dynamo Donuts for breakfast, and Mission Cheese for lunch, for dinner Steve and Emily decided to take me to one of their favorites in Noe Valley: Contigo. So we set off for dinner. 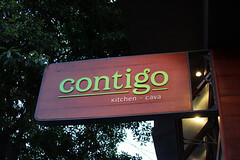 A short walk (about a mile or so from their place in the Mission) later, we arrived at Contigo. Nestled into a converted residential house (a feature common to most of the Noe Valley restaurants I’ve been to, actually), Contigo is a modest sized restaurant focusing on tapas, particularly those from Catalan. I was rather excited to go to Contigo, since I’ve been craving more Spanish food since last fall’s trip to Valencia, and I immediately liked the wide assortment of small dishes on their menu. We started with two of their appetizer dishes for the table: three sardine toasts, and two pork belly boccadillos. 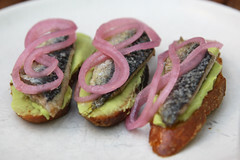 The first of these came out in a very nice presentation: three nice little toasted slabs of bread, each with some avocado sauce, a slab of nicely done sardine, some smoked salt, and a little figure eight of pickled onion. These showed that the chef of Contigo was able to do some good work, since he turned two ingredients that I generally dislike (avocado and sardine) into a quite pleasing appetizer. The pork boccadillos were next up, small sandwiches with a nice slab of perfectly seasoned and seared pork belly coupled with some pleasant aioli and the same pickled onions as the sardine toasts, and served up with some miniature potato chips. 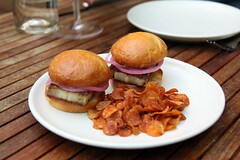 These made me chuckle a bit, since they were nearly identical to the pork belly sliders (yeah, I know, I’m beginning to accept the broader use of that word to mean “small sandwich”, albeit begrudgingly) I had three weeks previously at Odd Duck Farm to Trailer. But, like those, it was basically a perfectly executed little sandwich, and a good way to round out the appetizers. Moving into the main course, we selected a good cross sections of main dishes and sides, ranging from albondigas (meatballs) to Calamars a la Planxa (squid), which was the only dish I didn’t try since I was pretty sure it would trigger my seafood allergies. We also did a number of sides, including fried fava beans served up with a nice Meyer lemon sauces, patatas bravas (which were a spot-on match to the best I had in Spain), and a nice black mushroom coca (basically a Spanish flatbread dish similar to pizza). Everything basically worked here. 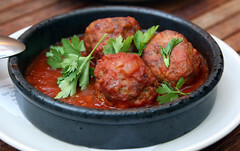 The albondigas were nice little moist packages of perfectly seasoned ham and pork in a nice sherried tomato sauce that highlighted the meat instead of hiding it. The fava beans were perfectly fried while not being greasy, and the lemon sauce brought out the green bean-like flavor nicely. The coca was also pleasant, they got a very good sear on the crust, which worked very well with the very dark mushrooms. In an attempt to redeem our reputation, somewhat sullied by reviewing high-concept over-priced pabulum served in the dark, the European Bureau of Offbeat Eats has attempted to get back in touch with the culinary roots of this blog. Although we at the European bureau can’t really compete with Los Manjares de Pepe after a hot day of dropping things out of airplanes, the least we can do is find a decent hot dog in continental Europe. As sometimes happens, you may find yourself on the scenic route from Flensburg (in the northern German region of Schleswig Holstein) to Sønderborg, Denmark. If you haven’t had your fill of herring and potatoes in Flensburg, you might be able to fill in the cracks with one of the better hot dogs on this side of the Atlantic.